Water outflow from Barker Dam helps many desert plants get extra moisture. 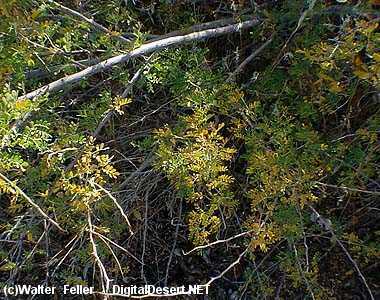 Cat's-claw acacia (acacia greggii), often forms thickets along desert streams and washes. It can grow as high as 20 feet, and blooms with pale yellow flowers. Because of the strong, curved thorns on its branches, it has been called tear-blanket, devil's claw, and wait-a-minute bush. Bees are attracted to the fragrant flowers and from them produce a popular desert honey. Often the four- to five-inch round woven nests of the verdin, a small grey desert bird, can be clearly seen in the upper branches.